A Bigger Boat, in association with Wing & A Prayer Pictures, is proud to announce - and reveal three first-look images from - THE SHED, a bold horror feature from New York-based writer/director Frank Sabatella. The thriller recently wrapped filming in upstate New York and is eyeing a 2019 festival run. 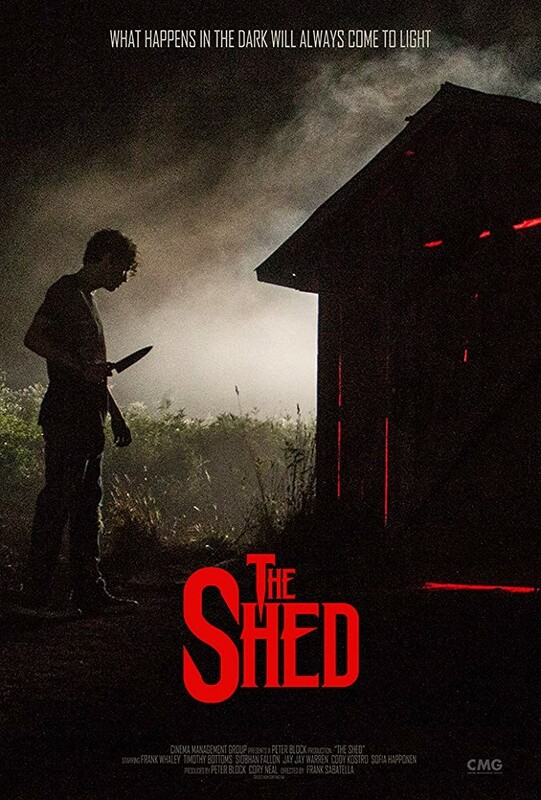 THE SHED stars Timothy Bottoms (The Last Picture Show), Frank Whaley (Pulp Fiction), Siobhan Fallon (Men in Black), Jay Jay Warren (Amazon Prime's Bosch), Cody Kostro (CBS' Elementary), and newcomer Sofia Happonen. It is produced by Peter Block, godfather of Lionsgate's blockbuster SAW franchise, and producer of House At The End Of The Street); Cory Neal, producer, who produced the ski-lift thriller Frozen with Block, as well as the Hatchet series; and Wing & A Prayer's Josh Crook (The All Nighter). Sabatella previously wrote and directed the 2011 Lionsgate release Blood Night: The Legend of Mary Hatchet, as well as a number of holiday-themed Halloween shorts via his New York-based production shingle, Sideshow Pictures. Said Sabatella upon the completion of filming, “I'm really excited about our dynamic cast of veteran actors and incredibly talented fresh faces that bring an interesting dimension of realism to the film. It is a unique horror piece with great scares and awesome moments that I think audiences will really respond to. I can’t wait to get it in front of them." Added Block, “Frank (Sabatella) and I wanted to take a cool horror set-up and use it to comment on current anti-bullying discussions, as well as to use a horror creature as a metaphor for the extreme outcomes that occur when the bullied are pushed too far."